SeeJane.org "How 'Thelma' Still Drives Geena Davis" "Geena Davis Predicts ‘Dramatic Change’ for Women in Film" "How Geena Davis Became a Champion for Women on Screen" "Geena Davis Knows Women Are Good for Hollywood's Bottom Line. So What Gives?" Davis received the Academy Award for Best Supporting Actress for her role as the offbeat dog trainer Muriel Pritchett in Lawrence Kasdan’s The Accidental Tourist. She was again nominated for an Academy Award and Golden Globe for her performance in Ridley Scott’s Thelma & Louise, in which she co-starred with Susan Sarandon. Davis went on to receive a Golden Globe nomination for Best Actress for her portrayal of baseball phenomenon ‘Dottie Hinson’ in A League of Their Own. Earning the 2006 Golden Globe Award for Best Performance by an Actress in a Television Series – Drama, Davis broke ground in her portrayal of the first female President of the United States in ABC’s hit show Commander in Chief. Davis made her feature film debut starring opposite Dustin Hoffman in Tootsie. She went on to star in such films as The Fly, Beetlejuice, Angie, The Long Kiss Goodnight and Stuart Little. Few have achieved such remarkable success in as many different fields as Davis has: she is not only an Oscar and Golden Globe-winning actor, but a world-class athlete (at one time the nation’s 13th-ranked archer), a member of the genius society Mensa, and is now recognized for her tireless advocacy of women and girls nearly as much as for her acting accomplishments. 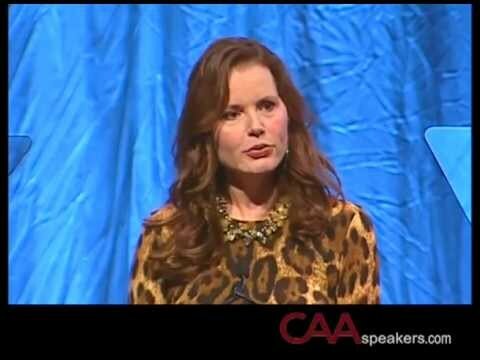 She is the Founder and Chair of the non-profit Geena Davis Institute on Gender in Media, which engages film and television creators to dramatically increase the percentages of female characters — and reduce gender stereotyping — in media made for children 11 and under. Davis was appointed Special Envoy for Women and Girls in ICT for the UN’s International Telecommunication Union (ITU), and is an official partner of UN Women. She is also co-founder and chair of the Bentonville Film Festival (BFF), whose mission is to champion women and diverse voices in all forms of media. Geena Davis and festival co-founder Trevor Drinkwater founded the Bentonville Film Festival in 2015 to champion women in media. BFF’s mission is to encourage content creation in film and other forms of media that reflects the diverse — and half female — world we live in. BFF proactively supports content creation by women and diverse voices with a platform to showcase their work and, with the help of our partners, is the only film competition in the world to guarantee theatrical, television, digital and retail home entertainment distribution for its winners. The Festival takes place in early May in Bentonville, Arkansas and is research based and commercially driven. Recently, Davis starred in 20th Century Fox’s The Exorcist; a serialized psychological thriller based on the 1971 book of the same name, Marjorie Prime, based on the Award-Winning play and Dear Angelica, one of the first VR narrative films from Occulus. Thelma & Louise is a cultural landmark that remains a touchstone for women around the globe. The movie struck a nerve and women of all ages feel a passionate attachment to it. From the lectern, hear Geena celebrate sisterhood, discuss what the movie meant to us then and what it means to us now --- as well as speak to why and how being cast in the movie changed Geena’s life --- and spurred her into creating a women’s empowerment non-profit and becoming a lifelong advocate for women. Quickly becoming recognized for her tireless advocacy of women and girls nearly as much as for her acting accomplishments, Geena has made it a life long mission to bring gender equality into the popular culture lexicon. At the forefront of changing female portrayals and gender stereotypes, through cutting-edge research, education, training, strategic guidance and advocacy programs, Geena's mission is to work within the entertainment industry to dramatically alter how girls and women are reflected in media. From the lectern, hear Geena celebrate sisterhood, discuss what her movies meant to us then and what they mean to us now --- as well as speak to why and how being cast in Thelma & Louis changed Geena's life --- and spurred her into creating a women's empowerment non-profit and becoming a lifelong advocate for women.